You are here: Home / Learn / Squeeze Your Tea Bag: Should You or Shouldn’t You? Squeeze Your Tea Bag: Should You or Shouldn’t You? What happens when you squeeze your tea bag? When a wet tea bag is squeezed, the resulting liquid is loaded with tannic acid, which is a type of polyphenol known as gallic acid. Polyphenols are good micronutrients present in many fruits, vegetables, and plants. Because tea, especially black tea, has a lot of tannic acid, it contains a lot of gallic acid and therefore, many polyphenol micronutrients too. Other good things about tannic acid are that it kills germs because it’s antimicrobial. It stops cells from becoming cancerous because it’s anticarcinogenic. It stops cells from changing because it is antimutagenic. It keeps free radicals from harming cells because it is antioxidative. And tannic acid has been shown to help blood to clot and to reduce blood pressure! But here’s the deal. If tannic acid is good for you, why shouldn’t you squeeze your tea bag? Tannic acid is what gives tea its bitter, sour or astringent taste. The more tannic acid released into the water, the more bitter or sour taste is present. If you are working on brewing a perfect cup of tea, whether it is green or black, then why make it nasty tasting by adding those bitter tannins into the lovely cup of tea? Tea bags can split and now you’ve got loose tea leaves floating around in your tea cup. Sip. Spit. Tea is hot. Invariably, there will be a time when you are squeezing the tea bag that your fingers are going to touch that hot tea. Ouch! It really looks unsophisticated to squeeze out a tea bag. It’s never a proper method of drinking tea in society or at an afternoon of high tea. It can make your cup of tea cloudy, and appearance of the tea in the cup is part of the experience of drinking tea. 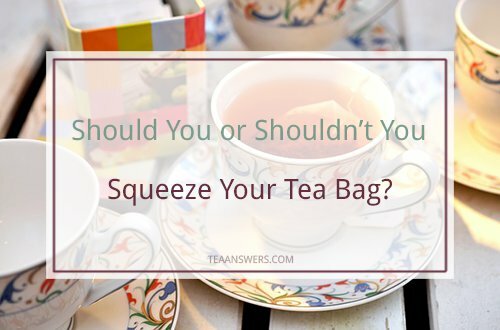 Well, if you’ve been squeezing tea bags forever, then you’ll notice a difference in the taste if you don’t squeeze. So squeeze away. If you like sweetened tea, the sweetener will mask that bitter tannin flavor. You can use the tea leaves left in your cup after the tea bag splits to do a tea leaf reading. You can try a tea bag squeezer or press for extra squeeze power, which helps if your teabag doesn’t have a string to wrap around a spoon. Who cares what others think! Squeezing sets you apart from the hum-drum of the upper crust – whoever they are. What is Better: Loose Tea or Tea Bags?